Utah- Talk about a holy whacking. The Utes clobbered Oregon in Eugene 62-20, and the Utes can make the case for being a top five team in the nation. This was a beatdown of historic proportions. Travis Wilson was a stud at quarterback, as he went 18/30 for 270 yards and 4 touchdowns. He also rushed for 100 yards and a touchdown. Wilson easily had the best weekend in college football and it was not even close. The Utes defense also shutdown Oregon’s offense which was also impressive. The PAC 12 slate wont be easy, as the Utes face off against Cal, USC, Arizona, ASU, and UCLA still. LSU- Granted, Leonard Fournette is really the only reason the Tigers are even here, but his performance on Saturday was flat out phenomenal. 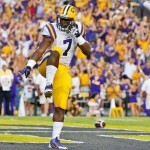 Fournette rushed for 244 yards and 2 touchdowns, as he was the only bright spot yet again on the Tigers offense. His 62 yard rush to the house was incredible, as he left the Syracuse defenders in the dust. As for the Tigers, they need to play better complete games. LSU is still one of the teams to beat in the SEC, and might be the favorite in the West division. But for now, Brandon Harris is going to have to throw the ball better, because LSU’s current offense is in Jordan Jefferson 2.0 mode. Still, absolutely unreal performance from Fournette. Michigan- By tomorrow, the Wolverines will find themselves among the top 25 in the nation. That’s what they deserve after pitching a 31-0 shutout on the #22 BYU fighting Mormons. Michigan’s defense was very impressive, and held Tanner Mangum to just 55 yards passing. It almost is astonishing at how much better the Wolverines already are under Jim Harbaugh. De’Veon Smith is going to be a force in the running department all year for Michigan, but Jake Rudock is still a question mark at the quarterback spot. We’ll see how for real the Wolverines are when they face off against Northwestern, Michigan State, and eventually Ohio State. Missouri: Lets be honest; the Tigers should have never been ranked anyways. However, the Tigers looked awful all night, especially on offense. It is almost mind-boggling how this team won the SEC East the past two seasons. Credit Kentucky for making the necessary plays, but Matty Mauk is one of the most inconsistent passers in college football. The Tigers defense is nowhere near as good as it used to be. It could be a rough year in Columbia. Arizona: This game was over after the first quarter, and for it being the prime-time game of the week, it was a horrible game. Anu Solomon had to leave the game after getting knocked out, and the game was never in doubt after that. UCLA completely dominated the Wildcats in every aspect of the game. With the PAC 12 being a consistently deep conference, the Wildcats will still have several games that will be tough on the schedule. The good news is that they can hopefully forget about this one. Georgia Tech: The Yellow Jackets dropped the ball big time on the road in Durham against Duke 34-20. A late fumble from Justin Thomas sealed Tech’s fate late in the fourth quarter, but the Yellow Jackets defense has been surprisingly bad so far this year. Luckily for Tech, they play in the ACC Coastal, where literally anyone could still win the division. Oregon: This is pretty obvious. Oregon got hammered at home, and never even stood a chance. The Ducks defense is beyond pathetic, and we should have realized this after Eastern Washington in week one dropped a 40 spot on them. Is this the end of the Ducks’ PAC 12 regin? It looks like it will most definitely take a major step back this year, but I’m not going to go as far as saying Oregon’s best days are behind them. However, this season could be one to forget in Eugene. 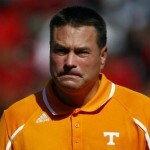 Tennessee: Another blown game? 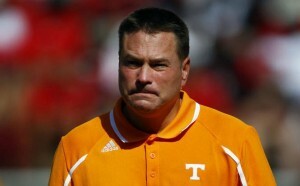 Butch, please. What horrible 4th quarter clock management. I almost feel bad for Vols fans. They had this one in the bag up 27-14 late in the 4th at the Swamp. This now marks two times already that Tennessee has blown double-digit 4th quarter leads. Butch Jones has continued to play not to lose, and that strategy is clearly not working. Joshua Dobbs really played a solid game at quarterback, and Jalen Hurd was fantastic on the ground as well. Just another game Tennessee should have won. With Arkansas, Alabama, and Georgia coming up, the Vols better figure out how to close out games soon. Texas’ Special teams: Losing back to back weeks because of special teams errors has to be tough to swallow for all Longhorns fans. Nick Rose missed the game-tying extra point against Cal, and this week punter Michael Dickson muffed a snap deep in his own territory, allowing Oklahoma State to set up for a game winning field goal. Two brutal losses for Charlie Strong. The good news for Horn’s fans is that this team is much improved since the season opener, and the young players are starting to make the most of their opportunity. The bad news is that Texas has to face TCU and Oklahoma in the next two games. Good luck with that. 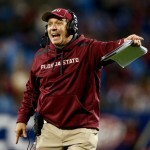 College Football Week 5 Recap: Is Anyone Good? This is College Sports Insider! Opinions and Facts combined together to make you think, learn, and know! This Is College Sports Insider, this is your platform, this is the future! © 2019 CSInsider.com. All Rights Reserved.